For R.H. and L.H. doors. Surface mounted. Requires a 7/8" diameter hole for cylinder and 57/64" diameter mounting hole. 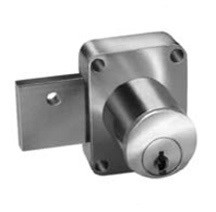 The "PLUS" feature allows you to remove the cylinder from the pin tumbler box locks while lock remains in place. No mounting screws need to be removed. Simply use a 5/64" allen wrench from the back to remove the cylinder and plug for re-keying. Key is removable in both locked and unlocked positions. Comes with: 2 - keys, strike and mounting screws.